It’s not a secret from anyone that this is my favorite café in Zurich, however I’ll be as objective as I can in reviewing the place and you are more than welcome to go and check it out for yourself! If you’re visiting Zurich you cannot miss it, not because of its size (as the name suggests), but because of the location – Limmatquai 118 – right in the heart of the city overlooking the Limmat river. Grande is actually quite limited in space and believe it or not if this had to change then it wouldn’t be Grande anymore. Sounds silly, but it’s true. The place has the charm of an Italian espresso bar – small, welcoming and at the same time very busy. This though doesn’t seem to affect the so valuable for me connection guest – barista. Grande offers a blend of craftsmanship and hospitality that, unfortunately, is not easy to find elsewhere. 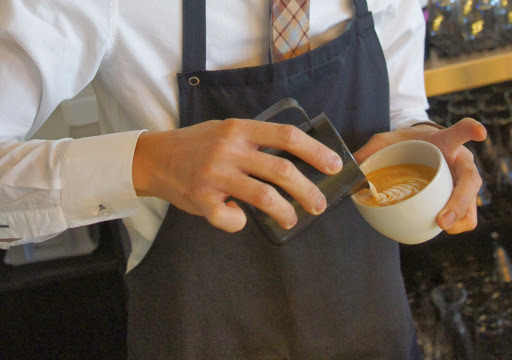 If you want to see some latte art being poured right in front of your eyes be sure to take a seat at the bar. Milo is among the best latte artists in Switzerland, he took second place on the Swiss Latte Art Championship this year. His colleague Fabio is also a coffee passionated guy and took part in the Swiss Brewer’s Cup Championship. He is learning really fast, so considering that one of the best is his teacher, the next latte art competition will be quite interesting. The espresso at the moment is a semi washed Sumatra, Mandheling, grown at around 1350m elevation. It’s thick bodied with pleasant earthy aromas and has sweetness of brown sugar. (When I learn to recognize more flavors I’ll definitely come back and add more details!). The coffee is freshly roasted with love from Henauer Kaffee, at least that’s what it says on the packages you can buy for home use. You can have a cappuccino, caffé latte, cortado with a soya milk option. This Xmas, when flying back home, I had to do a six-hours scale in Zurich. I decided then to spend my time in the city and I had the chance to find this place and find a place to sit down there.